A report out today updates the progress of a $25-billion federal mortgage-relief settlement with the five largest mortgage companies in the country that was announced in March. Attorney General Tom Miller says those mortgage servicers have provided $19-million in relief to Iowans since the settlement was reached. “Of that, $3.1-million are first-lien principal reductions that have been offered and accepted. One-point-five-million dollars of that, of the 3.1, are those that are in place and are not in trial and have been executed,” Miller says. He says $4.8-million helped homeowners in another category. “They were the people who had their home mortgage exceed the loan — so-called people who were under water — and they were making their payments, and they saw around them people getting refinance with a lower interest rates as the interest rates came down, particularly in home mortgages. But they couldn’t refinance because they were under water and didn’t qualify,” Miller says. 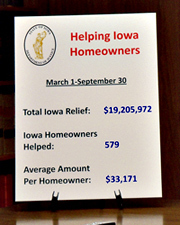 There were 579 Iowa homeowners who got some sort of relief from the program. The average paid to Iowa homeowners is just over $33,000, which is well below the national average of 84-thousand dollars. Miller says there are a couple of reasons the payment to Iowans is lower. “One, homes sell for more on average in the rest of the country. And the other thing is sort of a good thing in a way — we didn’t have the housing bubble to near the extent that other states did,” Miller says. Miller says it is not too late for people to take advantage of the program. “I would ask Iowans who have any kind of concern or distress concerning their home mortgage to contact the Iowa Mortgage Concerns Hotline, the number is 877-622-4866,” Miller says. Iowa’s total portion of the settlement is 40 million dollars and Miller believes the state will hit that number once all the homeowners have taken part. For more information on the settlement, go to the Iowa Attorney General’s website at: www.IowaAttorneyGeneral.gov.